This pork roast is so easy to make it almost cooks itself. 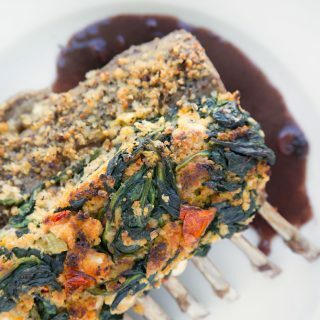 But you can take all the credit when your guests start to moan after tasting this deliciously seasoned Rack of Pork! 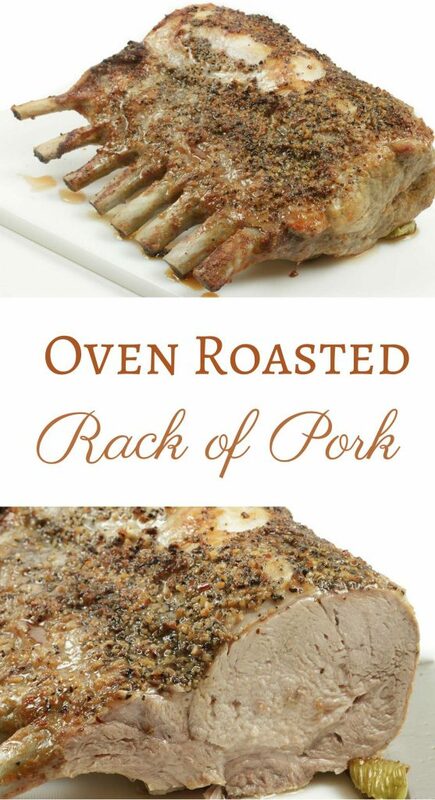 When you want to cook up deliciousness in your kitchen for the holidays or a special Sunday Dinner my Oven Roasted Rack of Pork will definitely be a crowd pleaser. It’s easy to make and can be in your oven roasting to perfection in less than 10 minutes. 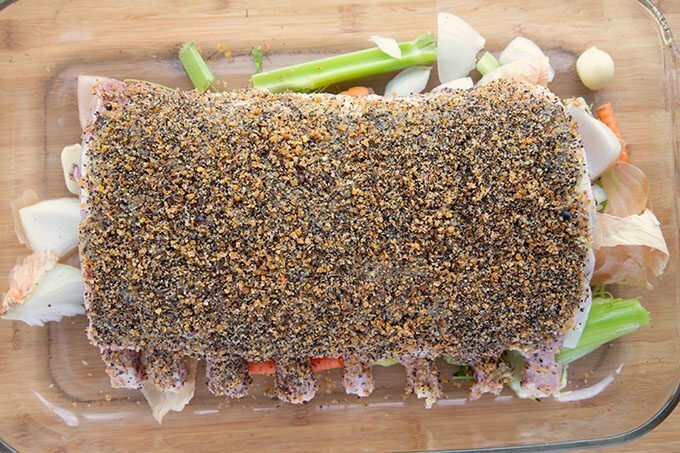 It will actually take longer to preheat your oven than it will to prep this lovely pork roast. 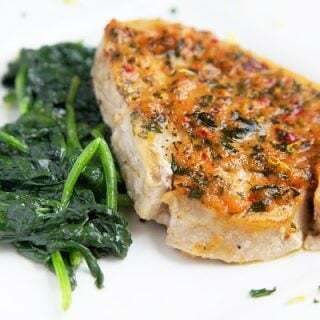 Cooking pork is really pretty easy and since the days of overcooking pork to make sure its safe to eat are behind us, you can now cook your pork a little less serving it pink, juicy and delicious. Of course, my recipe keeps your well-done pork roast just as tasty. There are a few simple rules for roasting meets. Let the roast come to room temperature for about 30 minutes. Reduce oven temp to 325 degrees Fahrenheit and cook approximately 15 minutes per pound till the desired doneness. Use a meat thermometer to make sure the roast is at the temperature you desire. Remember your roast will increase in temperature approximately 10 degrees after removing from oven. Medium Rare 145 degrees F; Well Done 160 degrees F.
How do I season a Pork Roast? I have two tried and true methods for roasting meats. Coat the top of the roast with Dijon or Stone Ground Mustard. Sprinkle liberally with Montreal Beef Seasoning. Place rough cut onion, celery and carrots (including skins and leaves) in the bottom of your roasting pan. When Roast is almost done add 1 cup very hot stock to the bottom of the pan. I use a combination of beef and chicken. 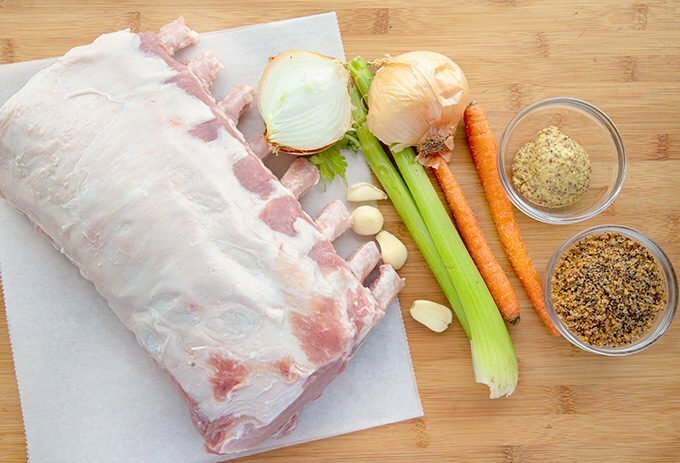 What ingredients to I need to make a Roasted Rack of Pork? Other than the roast the ingredient list is short. Here we have the ingredients (mise en place) for the roasted rack of pork which includes the vegetables for the bottom of the pan and my favorite seasoning for meats, Montreal Beef Seasoning. 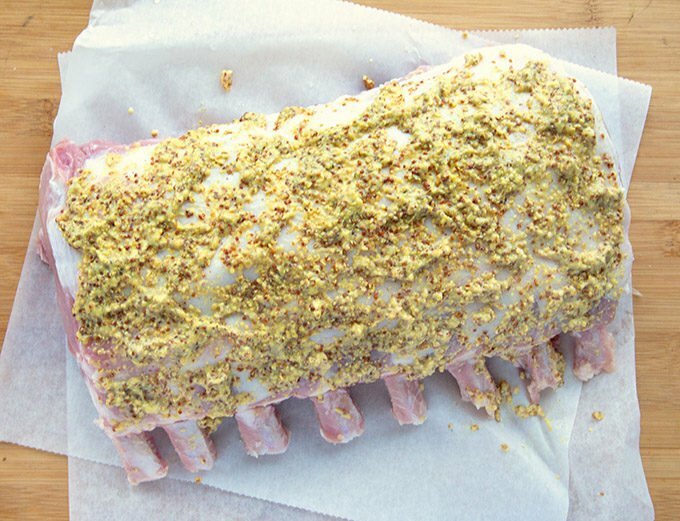 I prefer to use mustard with my rack of pork and for this roast, I’m using stone ground mustard, Dijon mustard or olive oil can be used instead. Coat the top of the pork roast (fat side) liberally with mustard (or olive oil). Coast the top of the pork roast with seasonings. I used Montreal Beef Seasoning. 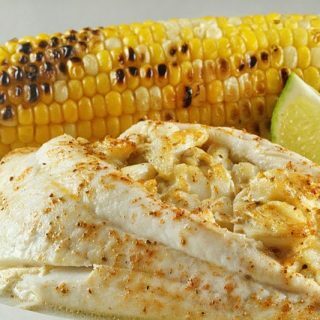 Feel free to use sea salt and cracked black pepper, or make your own Montreal Seasoning. I’ve included a recipe for this seasoning in the recipe box. Add roast to baking pan with rough cut vegetables underneath to keep the roast off the bottom of the dish to allow air to circulate more freely around the roast. The veggies also add flavor to the pan drippings. Should I cover my roast when cooking? The answer is no. And the reason is the coating of seasonings will help keep the roast moist. If you feel better covering the roast do it only for the first 45 minutes of cooking, uncovering for the rest of the cooking process. I was in the mood for garlic mashed potatoes, and although Lisa does like garlic, it has to be worked into the dish and not overpowering. I thought that roasting the garlic would be the best choice to add flavor while still keeping it from getting too strong, or overpowering the mashed potatoes. The garlic worked perfectly with its creamy butter-like pieces blending into the mashed potatoes perfectly. And to add even more flavor to this dish, we needed gravy. Okay, no one really needs gravy but it makes things so much more delicious. Serve your favorite vegetable and don’t forget the applesauce for those friends that can’t eat pork without it. 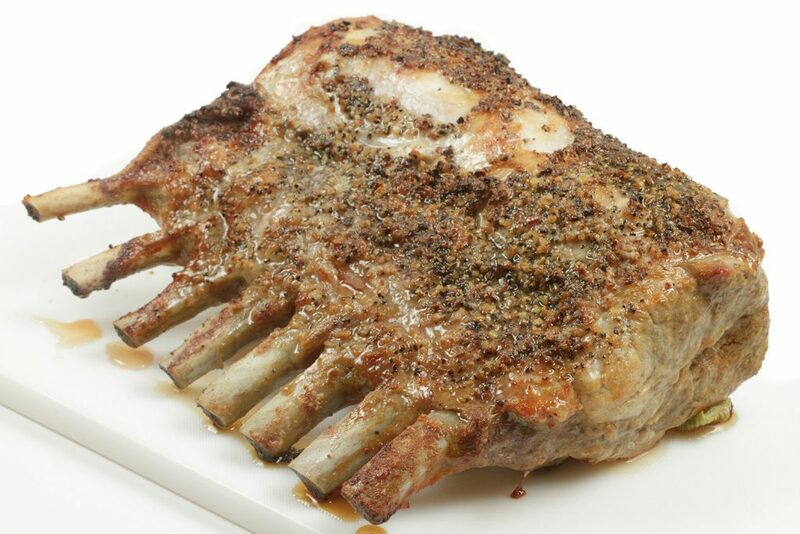 Years ago I use to serve 2 bone racks of pork in my restaurant, I would cook the larger full rack then cut them to order later in the evening after they were cooled. 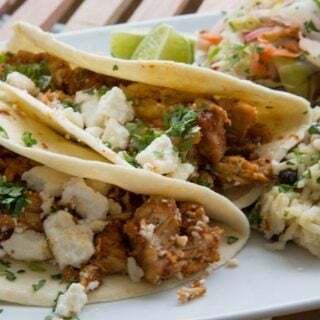 You have to think of these delicious pieces of roasted pork more along the lines of Prime Rib of Pork, and when you serve them they don’t have to be steaming hot. You want them to be fairly hot, but then serve them with the almost boiling pan gravy to give it that little bump. The pork will be tender and juicier than you have ever had before. The other important factor in having this pork come out so tender and juicy is in the roasting. A very high temperature for a short time will sear and seal the meat, keeping the juices inside. 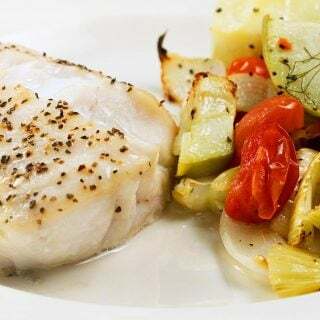 You just want to make sure to reduce the heat of the oven to finish the slow roasting process, which not only ensures a juicy cut of meat but also helps reduce shrinkage of the product. You also want to remember to always cook the meat with the fat side up, so the fat runs through the meat as it roasts, rather than just into the pan. Don’t worry about trimming any extra fat away before roasting, you can always remove it before serving. The fat does add flavor! This was the most flavorful, tender piece of pork I think I have ever had, it even surprised me. I hope you do try this if you can find a good rack of pork, believe it or not, I found this rack at Costco and Sams Club for under $25.oo, who knew? I can’t wait to cook this again, but I will definitely invite some friends over to enjoy this magnificent piece of pork! 1 7-8 bone center cut rack of pork the weight on this roast will vary. Using a meat thermometer will ensure its cooked properly. 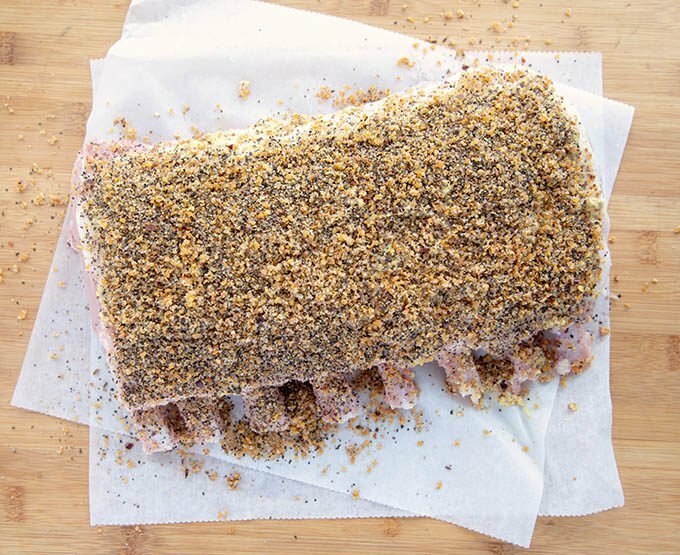 sprinkle entire rack with sea salt, pepper, garlic, and onion or just use my personal favorite Montreal Steak Seasoning instead of the other seasonings. place pan in preheat oven at 450 degrees for 15 minutes. after 15 minutes reduce heat to 325 and continue to roast for 1.5 - 2 hours or until internal temperature has reached 160 degrees for well done or 145 degrees for medium. Remove the Rack from the oven placing on a cutting board and allow to rest for 10- 20 minutes before slicing the meat. This will allow all the juices to remain in the rack, rather than have them run all over the plate, making the meat dry. While the rack is resting, place 2 cups of water in the roasting pan and place on the oven and with a spoon loosen all the baked in meat scraps from the pan, making your pan gravy. 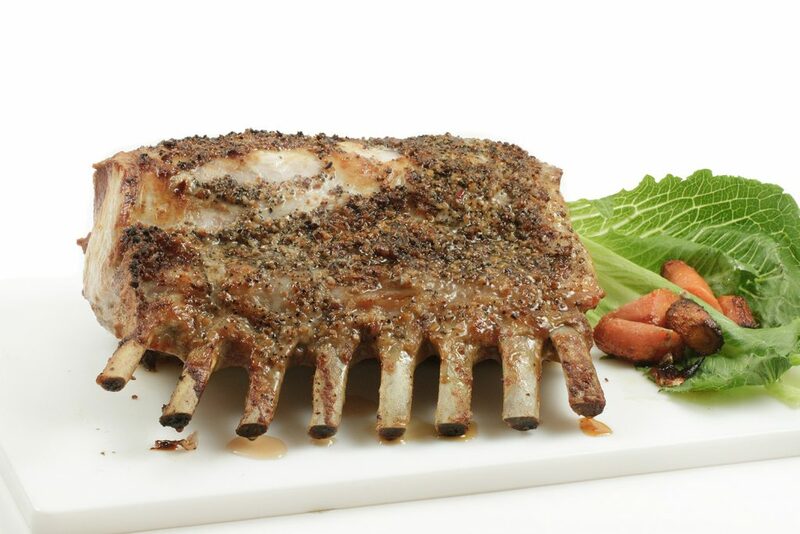 Cut the rack along the bones, making even portions of the pork, serve with your pan gravy and your favorite sides! my rack is 5 lbs..8 bones…what time do you recommend and is gravy a must? can this be tied and stuffed like a standing roast..i know it will be small. Thats pretty close to a normal weight, so I would only reduce the cooking time. 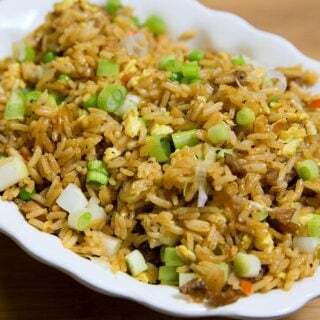 Oh my God, I just made it, so good and first time. Don’t like pork as much but this was so finger lickin good. When I bought the rib rack didn’t know what I would do and counted on Google search and viola there it was. The only thing I didn’t know if it was supposed to sit right on the tray for cooking as I put it on vegetables on the grilling rack and the juice dripped and burned and so did the onions which were not covered under the meat and the ones under the meat I don’t know where they went just melted into the ribs I guess. So, I used store bought 4 peppercorn gravy although I think this recipe gravy would have been a better option. I took pictures and sent to my friends and promised I’ll invite next time I make it since I know how good they were. Thank you for the great review and cooking is a learning process, every time you make something you get better until you perfect it. My roast is 13 lbs. How should I adjust cooking time? Thank you! that sounds like a double rack to me, my recipe is for 7-8 bones, how many bones is yours? If its a double I would split it in half to make cooking and cutting easier. 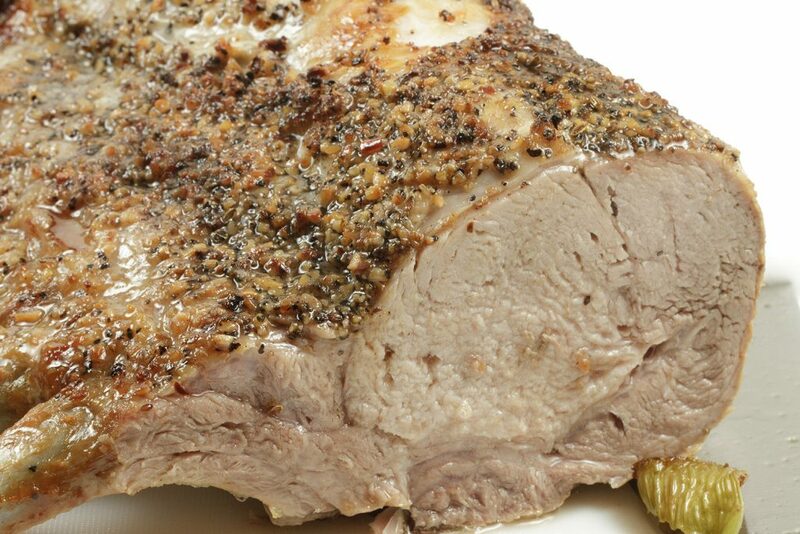 If you want to serve it as one roast, rule of thumb is 14-18 minutes per pound for the roast.